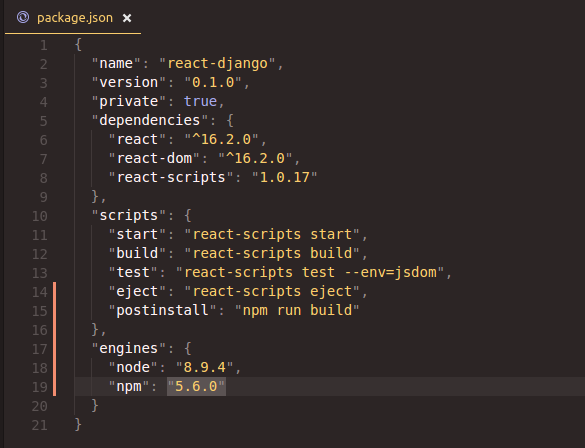 This is a follow up to my post on setting up a React-Django web app. You can take a quick glance if you’ve not seen it yet. TL;DR: The setup is deployed at http://react-django.herokuapp.com (nothing much there actually) and the code at https://github.com/nicholaskajoh/React-Django. We’re going to be deploying the app we setup in the previous post on Heroku. Heroku is a popular cloud hosting platform (PaaS) and offers a generous free tier which we’ll be using. First things first. You need a Heroku account. Head over to Heroku.com and sign up/login, then go to your dashboard at https://dashboard.heroku.com and create a new app. 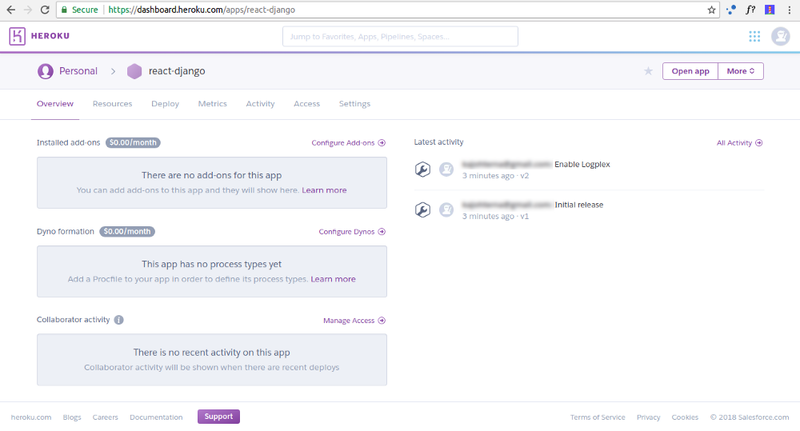 There are a couple deploy methods to choose from on Heroku (visit the deploy tab on the app page on the dashboard). Here, we’ll use the Heroku Git method via the Heroku CLI. You can use this guide to learn how to set up Heroku CLI on your OS. Now, let’s link our project to the Heroku app we created using the Heroku CLI and Git. Initialize a Git repository in the root folder of the project with git init (you need to have Git installed on your computer). Login with your Heroku account on the CLI using heroku login. 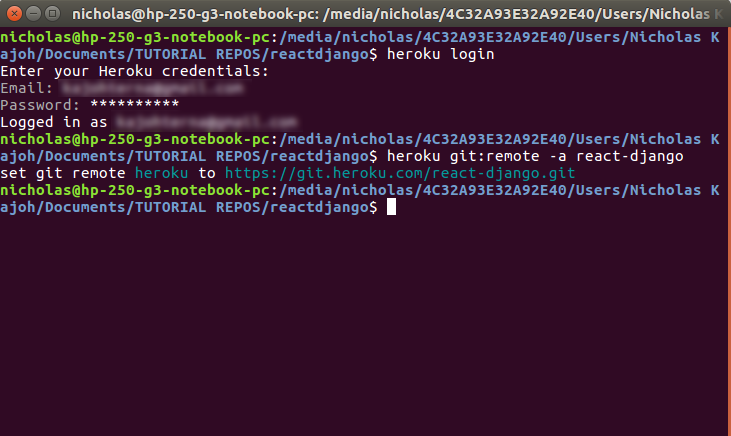 Add the Heroku remote via heroku git:remote -a your-heroku-app. I already initialized Git in the project prior to this. The React app build process depends on NPM, so we need Node.js. We also need Python to run Django. Heroku uses buildpacks to transform deployed code into slugs which can be executed by Dynos (server instances on Heroku). We’ll be needing two buildpacks. One for Node and another for Python. Our app would run on a Python server, even though we’ll use Node/NPM to build/bundle the React frontend. So the Python buildpack will be the main one in our config. The main buildpack determines the process type of the Heroku app. You can read about multiple buildpacks to understand how they work. 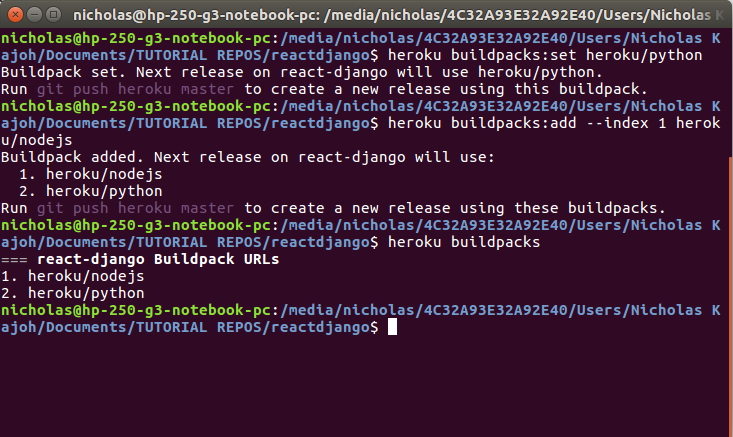 You can add buildpacks via the Heroku CLI. Head back to your terminal and run the following to set/add the buildpacks we need. Now add the buildpack for Node.js. We can see the buildpacks we’ve added by running heroku buildpacks. The last buildpack on the list determines the process type of the app. We need to tell the Node.js buildpack to build the React app after it has installed Node and NPM. We can do this by adding the build command npm run build in the postinstall hook. Notice that I specified Node and NPM versions in engines. The buildpack will install these exact versions. It’s highly recommended you use the versions running on your PC to avoid errors from a version that might be incompatible with your code. The Python buildpack, after installing Python looks for requirements.txt to install the dependencies in it. Add the following to the requirements file, including all the other dependencies your Django app needs. PS: Whitenoise helps to serve static files and Gunicorn is the HTTP server we’ll be using. By the way, you can specify the Python version you want by adding it to a file named runtime.txt in the project root. Add whitenoise to your wsgi.py file. In your settings.py, you need to add your Heroku domain to allowed hosts. NB: I personally prefer to add allowed hosts using environment variables e.g with python-dotenv. It’s time to commit and push the changes. Phew! $ git commit -m "blah blah blah"
After the build is done and your app has been released, visit YOUR-APP-NAME.herokuapp.com. Neat! Two libraries you might find really helpful when building your Django API are Django Rest Framework and Django CORS Headers. You should check them out! If you had any issues deploying please share in the comments. A lot of times, things don’t work the first time.